Four years ago I picked up two lovely, soft — and totally shapeless — cashmere cardigans at a thrift store for a few dollars each, with the vague dream of refashioning/upcycling them into warm and snuggly baby leggings for my then-tiny daughter. 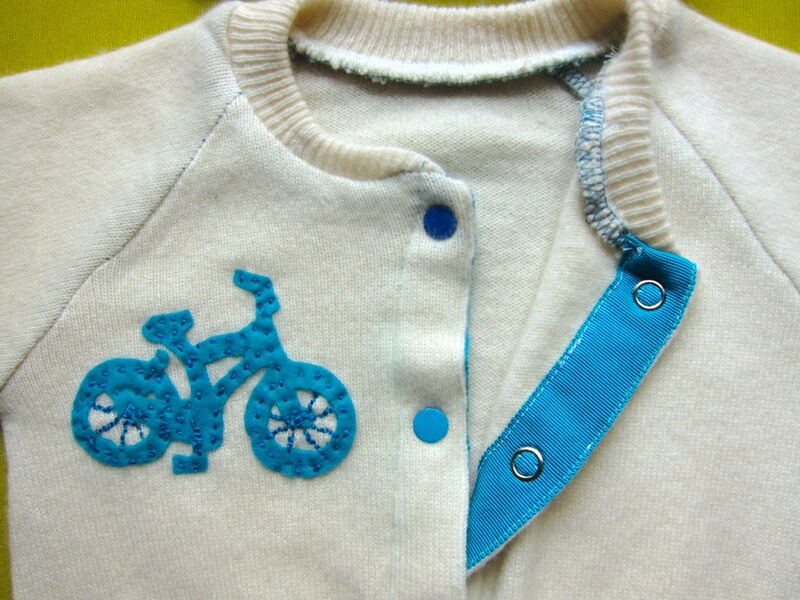 This raglan cardigan is part of the baby jogging suit from Kwik Sew's Sewing For Baby. I've made it twice as a hoodie (once in a custom Spoonflower print for my daughter, once in an owl print for a friend's baby), but wanted to make the collared version this time so I could make a matching hat. Fabric: A cut-up thrifted Lord and Taylor two-ply cashmere pullover sweater, plus some scraps of blue bamboo knit and some turquoise wool felt for the appliqué. Much better than buying actual cashmere yardage, since I could repurpose the ribbing as well. Notions: Embroidery floss, fusible webbing (part of my dwindling Lite Steam-a-Seam 2 packet), colorful snaps from Sew Baby, petersham ribbon from Pacific Trimming. 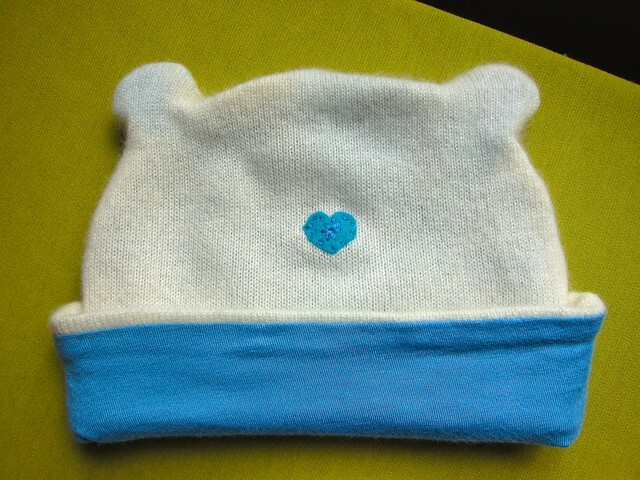 Size: Medium (3-6 months) for the sweater, and I just eyeballed the hat size to match. Modifications: No modifications, but I'm embarrassed at how much unpicking was involved in both of these items—somehow I managed to attach the collar wrong twice, and the ribbed hem too. Construction notes: The cardigan is simple, if you actually pay close attention to the instructions, which I apparently did not. SO. MUCH. UNPICKING. OF. SERGER. THREADS. 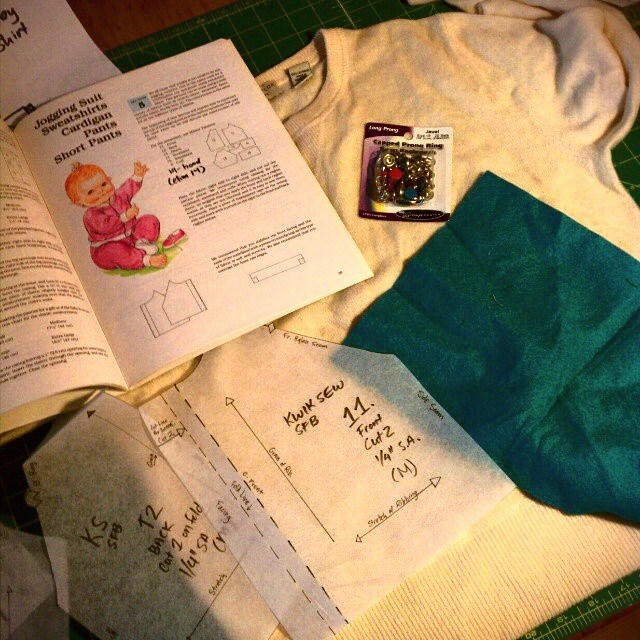 I did 90 percent of this project on the serger, reasoning that would keep the fine-knit cashmere from unraveling better than the machine. The embroidery bit was super fun—I fused the little wool felt shapes to the cardigan with fusible webbing, then just played around with some back stitches and running stitches. 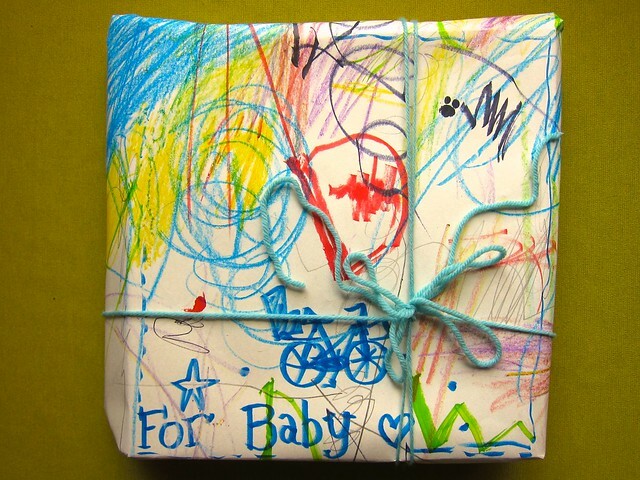 Finally, I wrapped the wee soft things in some of my daughter's extra artwork (with her permission), and tied them with a bit of leftover yarn—so much more fun than commercial wrapping paper and ribbon, am I right? Hmmm... I kinda want to make a matching set for my baby-to-be now with the remaining cardigan, a nice red cabled knit — they could wear them when they play together. P.S. I am happy to report that my daughter's scheme for a handmade mermaid fairy superhero doll with a big curly purple Afro is well underway—we designed the pattern together and she's mostly sewn and stuffed—all she needs now are a few finishing details. More to come soon! 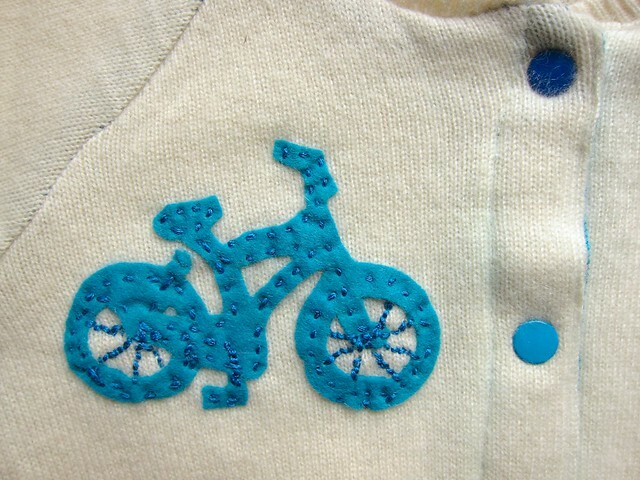 That applique is too, too cute! I LOVE the wrapping paper. Great use for some awesome kid art! I also love that you are making a custom doll with your daughter. The wrapping paper is very Liza Jane, really! ;) I'm channeling my inner art teacher. 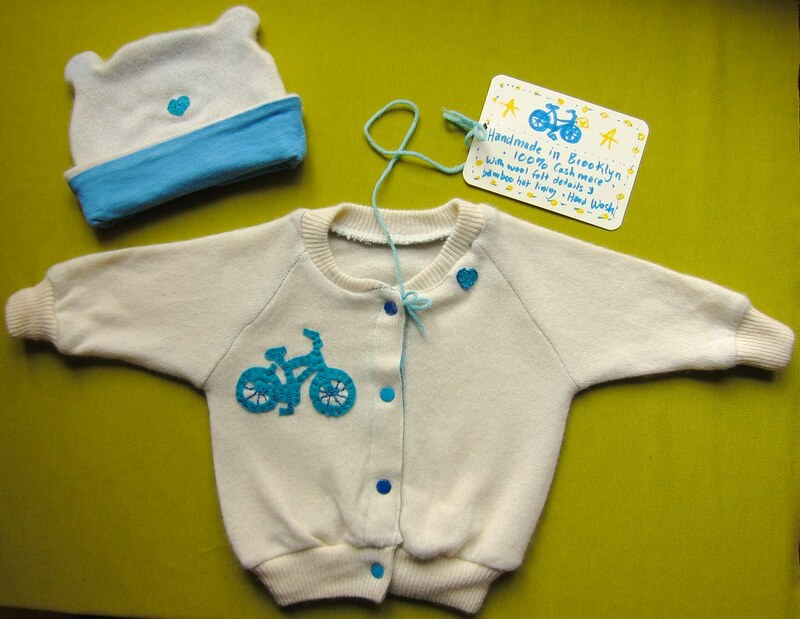 I want to comment on the cuteness of this set, but I'm still in shock over the thought of 5 bikes in a 1-bedroom! They are very serious bikers! Lovely mermaid! I see what you did there, you excellent mom! You need to put that up as a pattern (Craftsy has a no fee service) so I can tell pals to buy it to make their own. No, I don't get a fee for saying that. All of these projects are just awesome. I absolutely love that little upcycled cardigan (real wool is so wonderful, and I don't mind hand washing one bit!) and the doll .... the doll!!! She is fantastic. 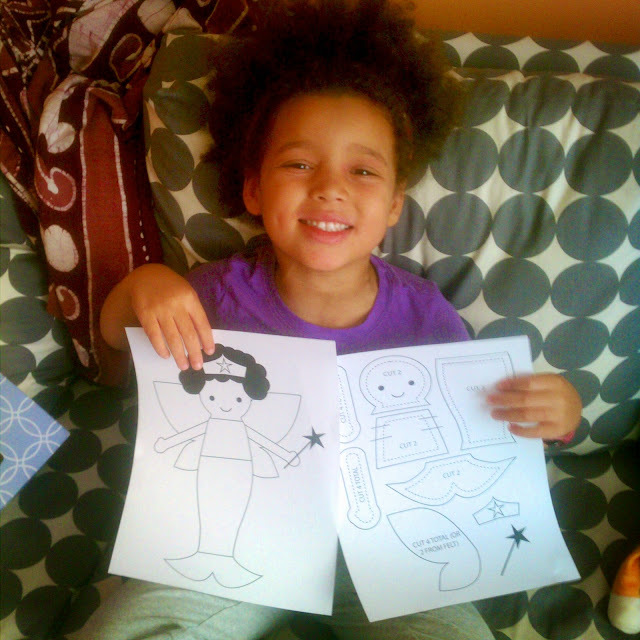 I love that you're helping Z's imagination come to life!